MARP’s October 18, 2014 meeting will be in the Conference Room on the 2nd floor of the Grand Rapids Transportation Center, beginning at 10 a.m. Opened on June 14, 2004, the Transportation Center was the first LEED-certified transit facility in the country. Built with a number of green features and strategies, Rapid Central Station combines cutting-edge technology with solid design to provide a passenger facility that is both functionally sound and environmentally responsible. When MARP last met at Rapid Central Station, our guest speaker was Seth Horton, a member of the architectural firm Progressive AE that designed Rapid Central Station and was also part of the design team for the new Grand Rapids Amtrak Station We will have an opportunity to get a close look at the new station which is located just south of the transit facility and slated to open later this month. The other exciting development in Grand Rapids is the opening of The Silver Line, a 9.6 Bus Rapid Transit (BRT) line that connects downtown with the southern suburbs. 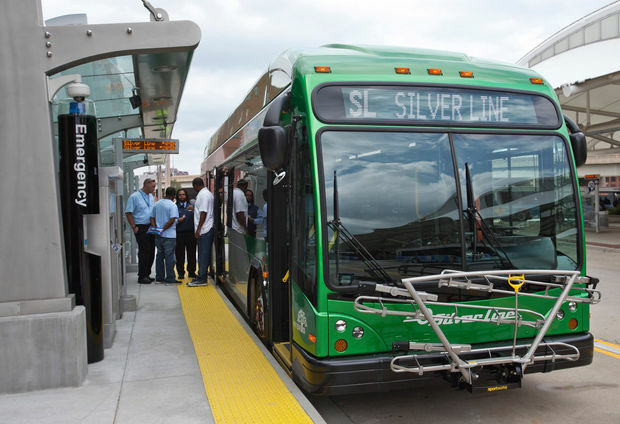 The Silver Line began boarding passengers on August 25. Supporters hope that the line will replicate the success of Cleveland’s bus rapid transit system, which has stimulated about $6 million in development since 2008. We have invited a speaker to provide us with details on the BRT operation and plans for expansion. You might want to plan to catch The Silver Line at some point on its route from the Park-and-Ride at 54th St SE, northward along Division Street to the Rapid Central Station. Be sure to take note of the Rapid’s newest feature, The Living Wall before you enter the building.